She’s made the difference in many young lives, encouraging students to grow personally and academically through the Academy of Construction and Design (ACAD) at Cardozo Education Campus. She’s given hugs to ease their tears, and a balance of “discipline and love” when needed. 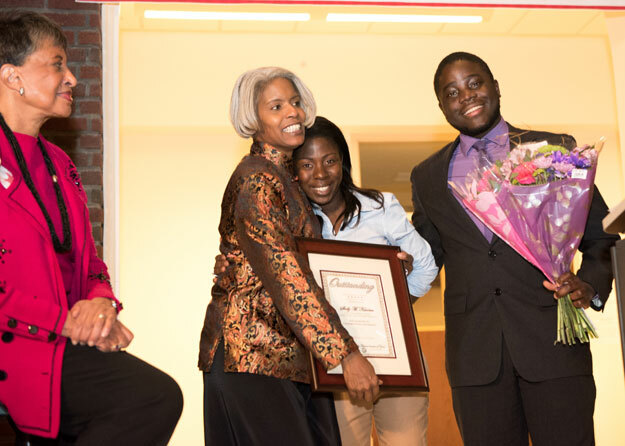 And for that, on Dec. 19, students and colleagues at Cardozo honored Shelly Karriem. Hug It Out Shelly Karriem, the director of the Academy of Construction and Design, is honored by students and colleagues at the Cardozo Education Campus. As the director of the Academy of Construction and Design, Karriem is a constant champion for both her students and the value of the program, which graduated its first class in 2007. “You have been my counselor, mentor, guide and teacher,” shared Marie Louise Ngo Mbock, an ACAD graduate. With a box of tissues in hand, Karriem listened – and dabbed tears – when praised for her work and dedication. “Shelly is absolutely everything that represents the Academy of Construction and Design. She has this ability to make you believe you can do anything,” said Erica Banks-Bennett, a teacher at Cardozo, who helped present Karriem with a signed banner for her years at Cardozo. The Academy will be leaving for a new home at the end of the 2014-2015 academic school year. 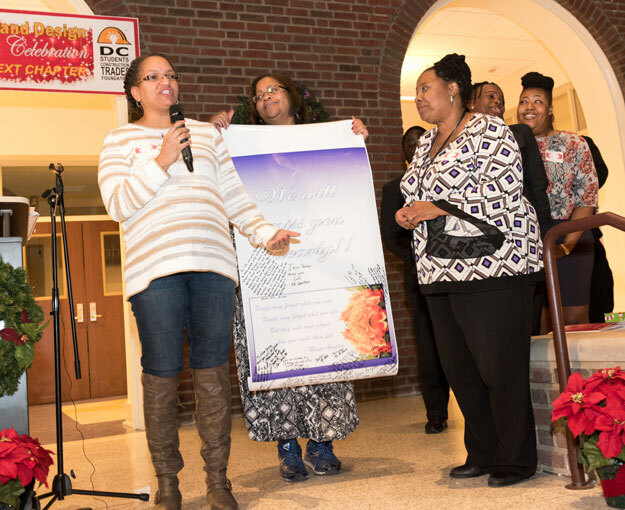 For the Good Times (From left) Teachers Erica Banks-Bennett and Jalyn Parker, alongside TransSTEM 's Shirley McCall, present Karriem with a signed banner wishing her well as she moves forward with the Academy. As the accolades wrapped up, past and present ACAD students gathered onstage for a final surprise for the woman affectionately known as the “mama bear” of the Academy. They declared Dec. 19 to be “Mrs. Karriem Day of Service,” to celebrate and continue the legacy of giving back to the community that has been taught through the career and technical education training program.